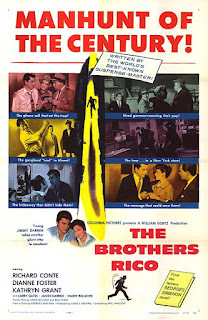 Tag line: "Three hunted men and their desperate women..."
But as we see in 1957’s The Brothers Rico, a film noir directed by Phil Karlson, getting “out” of organized crime is never really an option. At least it wasn’t for Eddie Rico (Richard Conte), a former bookkeeper for the mob who, three years earlier, decided to go legit. Since that time, Eddie and his wife Alice (Dianne Foster) have been living the good life in Florida. Eddie started up a dry cleaning business that is making boatloads of money, and the couple is days away from adopting their first child. For Eddie, crunching numbers for crime boss Sid Kubik (Larry Gates), a man he and his family lovingly called “Uncle Sid”, is a thing of the past. Then, early one morning, the phone rings. A man on the other end says that, at Uncle Sid’s command, he’s sending a guy to Eddie’s dry cleaning business, and this mysterious visitor is to be given a job so he can "lay low" for a while. Though confused by the request (which was unexpected), Eddie does as he’s told. But it doesn’t end there; later that day, Eddie is instructed to hop a plane to Miami so he can meet face-to-face with Uncle Sid. It seems that Eddie’s two brothers, Gino (Paul Picerni) and Johnny (James Darren), took part in a recent gangland shooting, with Gino pulling the trigger and Johnny driving the getaway car. What has everyone (including Uncle Sid) worried is that Johnny has disappeared, and because Johnny’s new wife, Norah (Kathryn Grant), is the brother of Peter Maleks (Lamont Johnson), a lawyer working for the District Attorney, Uncle Sid is concerned that Johnny might try to swing a deal with the D.A. and turn states evidence. Eddie doesn’t believe it for a minute, and assures Uncle Sid that Johnny is no stool pigeon. Uncle Sid agrees, but still wants Eddie’s help in finding Johnny and convincing him to leave the country until things cool down. Though Alice begs him not to get involved, Eddie flies to New York, then to Arizona, following various leads in an effort to locate Johnny. But is dear old Uncle Sid really interested in helping the Rico boys, or are Eddie and his brothers suddenly in the greatest of danger? Best known for his role as Don Barzini, chief rival of the Corleone family in 1972’s The Godfather, Richard Conte actually had a long and prosperous Hollywood career, appearing in (among others) film noirs like 1948’s Call Northside 777 and House of Strangers in 1949. In The Brothers Rico, Conte delivers an exceptional performance as Eddie, a strong family man who is nonetheless a bit naïve when it comes to his “old way” of life. Eddie truly thinks Sid wants to protect his brothers, even when it’s obvious to both Gino and Johnny (as well as the rest of us) that “Uncle Sid” isn’t the honest, upright mobster Eddie believes him to be. When Eddie finally figures things out, it hits him like a ton of bricks, and the fact that he may have helped track down his kid brother so he can be eliminated is more than he can stand. Conte appears in damn near every scene of The Brothers Rico, and his performance is proof positive that he was just as good a leading man as he was a supporting player. 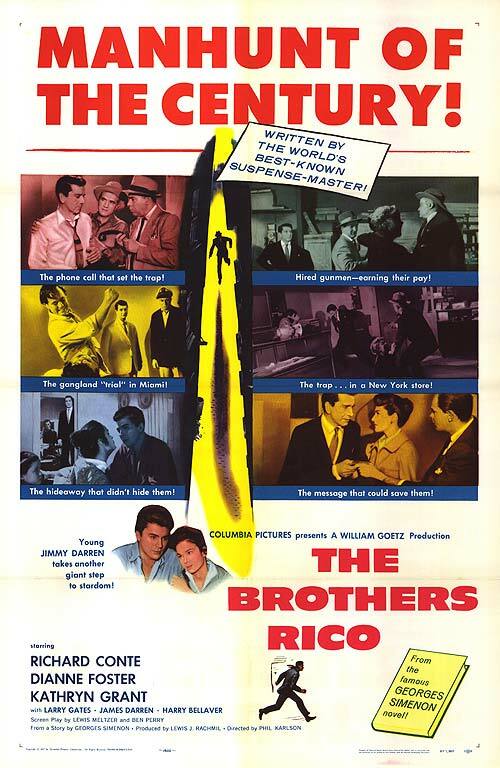 Whether you like the film noirs of the ‘40s and ‘50s or not, The Brothers Rico is a taut, expertly-paced thriller about family loyalties and organized crime that also features a strong turn by its star, and that alone makes it worthy of your time. "Whether you like the film noirs of the ‘40s and ‘50s or not." How can anyone not love film noir? I don't remember this one but it looks okay from the preview.